The ABL enables the accurate and secure placement of anchor bolts on concrete-deck forms prior to concrete placement. The structural heavy hex nut is attached to a preformed steel “chair,” which eliminates the need for an additional nut on the bottom of the anchor bolt. 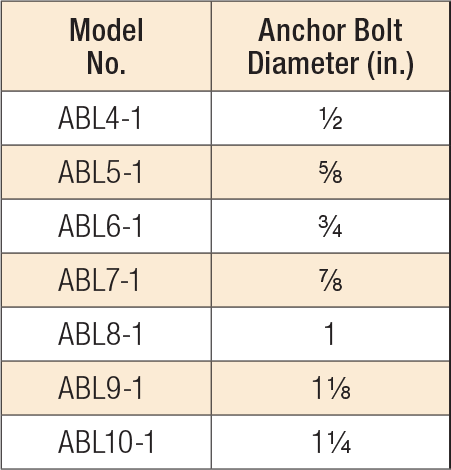 Available for anchor rod diameters from 1/2" to 1 1/4"
ABL See specific model numbers for code listings. ABL10-1 No evaluation report listing. ABL4-1 No evaluation report listing. ABL5-1 No evaluation report listing. ABL6-1 No evaluation report listing. ABL7-1 No evaluation report listing. ABL8-1 No evaluation report listing. ABL9-1 No evaluation report listing.